He’s impish. That’s how I remember him. Stubborn too. He refuses to wear his hearing aid, and then when his phone rings he’ll shout a hello at it. He can’t hear the caller so he mutters ‘idiot’ into the receiver and hangs up. My paternal grandfather, Valdevino Tenorio, is a month away from his 79th birthday. He’s hot-tempered and a man of many mistakes. The wrongs of his past have haunted his relationships with his children and wife, but in my memory he is nothing but kindness. From him I’ve inherited my need to express myself plainly and honestly. What you see is what you get. No hidden feelings or, many times unfortunately, no hidden thoughts. It seems simpler that way. You don’t have to keep track of multiple personalities or fronts. I think secretly, though, we envy those who can keep up fronts. It’s an excellent, if not necessary, skill to master. My grandparent’s home is a haven. Last semester, while in the throes of finals, the thought that kept me going was that soon I would be with them in the little town deep in Brazil’s interior–Pirapózinho–home to 24,718 people and a grand total of zero traffic lights. “Heaven on earth” as my father calls it. Grandfather rarely stayed there in his younger days when he roamed the country as a traveling salesman, but today he doesn’t leave. His ritual is the same every day, and it doesn’t alter much when we visit. He gets up at 4 a.m., turns on the lights in the corridor, peeks in on my brother Victor and me, chuckles and shakes his head as if unable to believe we can still sleep after the first rooster has crowed. He goes downstairs, his flip-flops smacking and sending loud echoes down the hall, makes his barley coffee and begins his day, which lasts until 2 p.m. when he can no longer walk because of back pain. The rest of the afternoon he spends lying down, either catnapping or listening to his portable radio. Years ago, in an effort to quiet retirement lulls, my father helped my grandpa begin a home business. 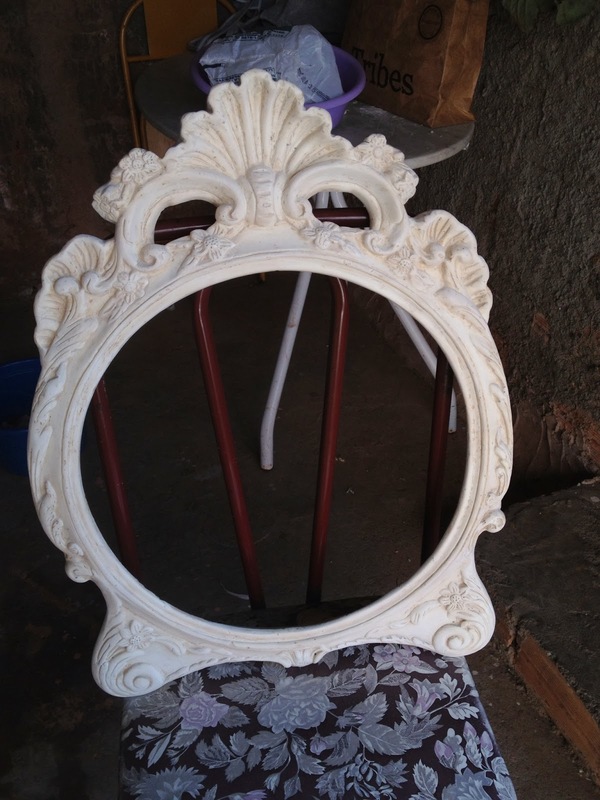 They made mirror frames out of plaster of Paris, painted and sold them. Then my father began working for the church, moved away, and it has been years since they made their last mirror frame. During the summer of 2012 I was nosing around in my grandparents’ shed when I discovered one of the last frames my grandfather made. It was derelict and useless without its mirror. I decided I wanted it. Almost 95 percent of my room is made up of second-hand pieces. 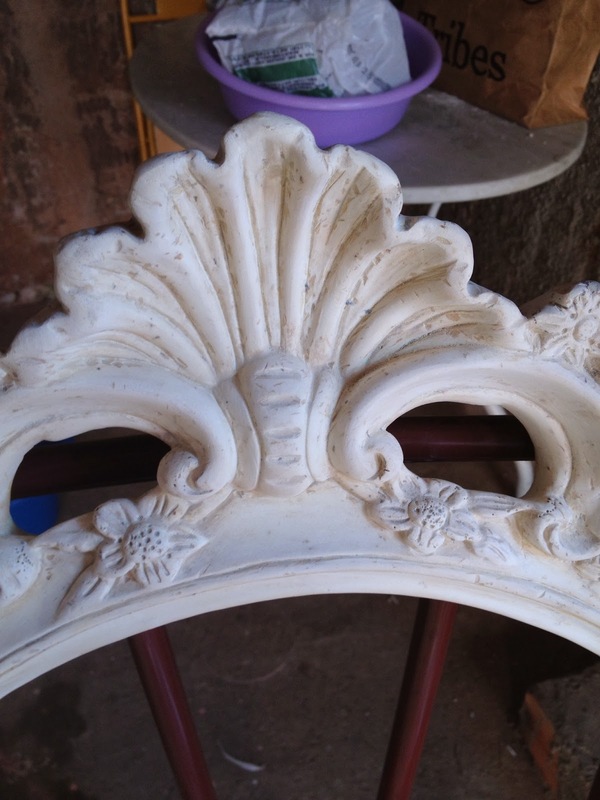 I call them “vintage pieces.” When my Brazilian boyfriend asked me to translate the word ‘vintage’ I thought awhile and then answered in frustration: “It’s just a fancy word for old.” Maybe that’s all they really are—old, but there’s something about old furniture that appeals to me. The memories and stories that I insist are hidden in the crevices of each piece beckon me as if promising that if I save them they will reveal their pasts to me. The problem with saving this delicate piece was I lived over 10,000 kilometers away. I reluctantly said good-bye. But I’m stubborn, remember? 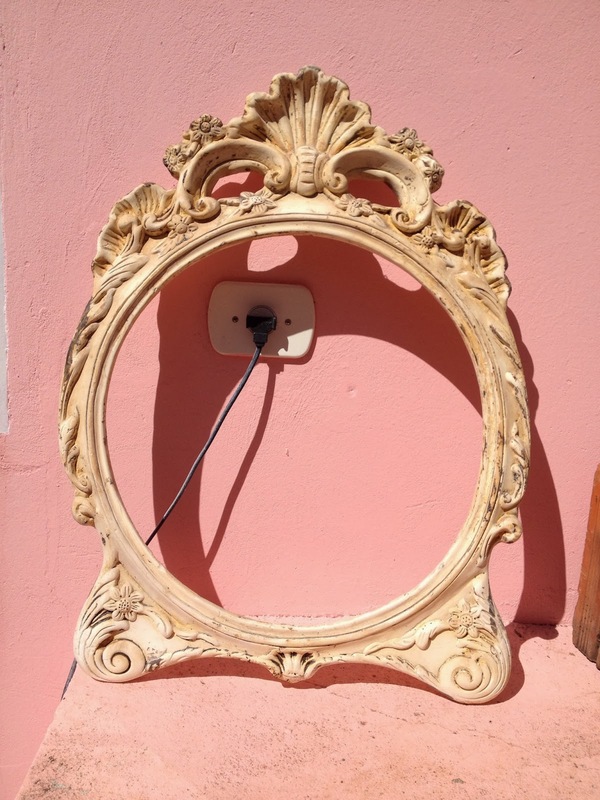 So this summer, the first thing I did when I went back to Pirapózinho was rummage in their shed until I found the frame in a condition much worse than I remembered. Because grandfather never finished it, it was still raw; left in a dark corner of the shed it was corroding and yellow stains were consuming the once white frame. Yet after I spent two weeks sanding the stains off, it looked stunning. Days later it was time for my frame and me to begin our trip home. A ten-hour car ride, a ten-hour flight in a plane where it traveled wrapped in bubble wrap on the floor where my feet were supposed to be, two connecting flights, and a one-hour car ride home later, we made it. Kind of. 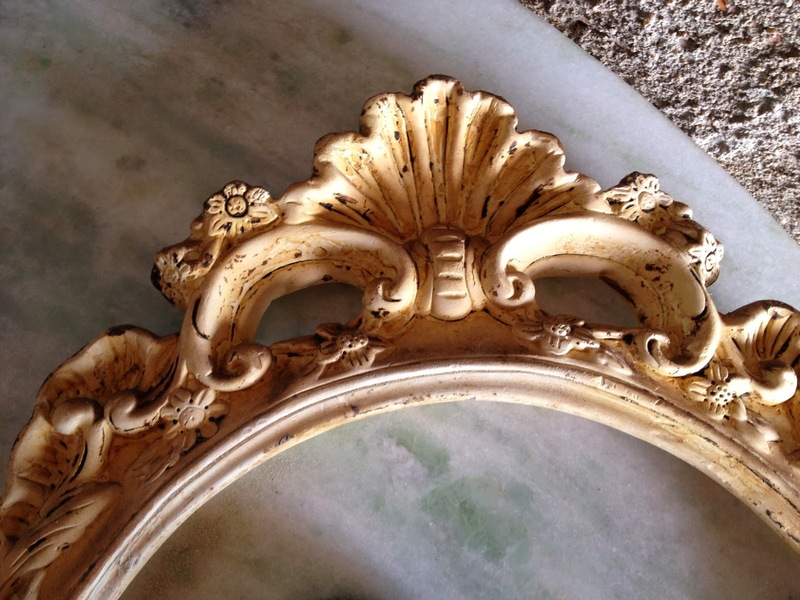 It cracked on the side; the bottom corner chipped off; the untreated plaster began to yellow again. That week it sat in a corner on the deck until I was brave enough to pick it up. I glued the pieces back together with sealer, sanded it and sprayed a finish, still undecided about painting it. It stayed on the closed deck waiting for me to make up my mind. Months later, I have now put it up on the wall facing my bed. I love its rawness and its defects. Maybe, for preservation’s sake, I will someday paint it, but for now it will stay up just as it is. The mirror is to me a little piece of my grandfather. I remember our time together, our jokes, his rawness and his deficiencies. Everyday the first thing I see when I get up is my grandfather’s mirror frame. 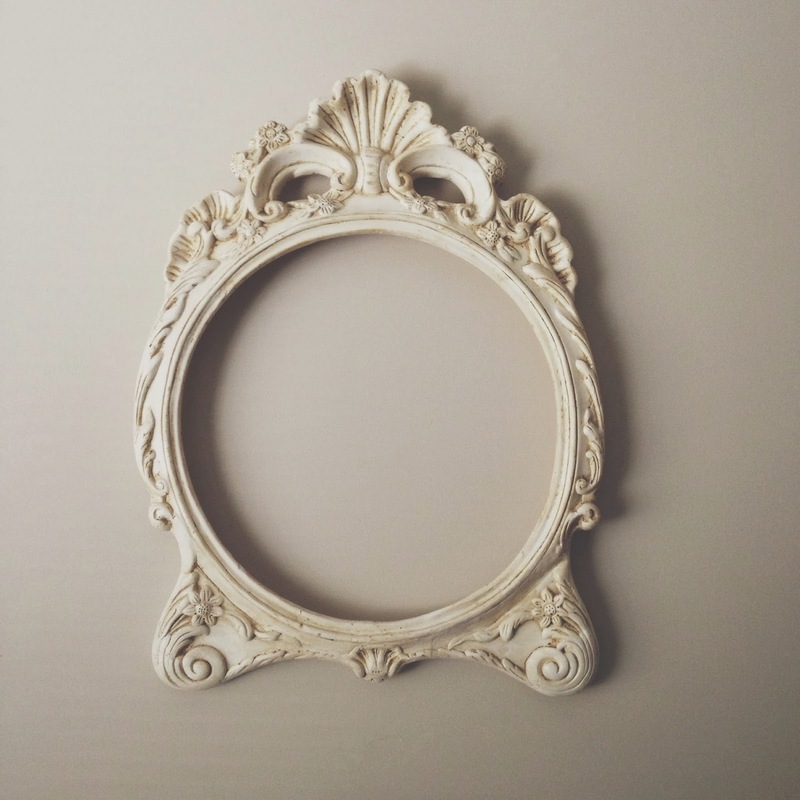 I am reminded that there is beauty in imperfection; I love my mirror frame because it is imperfect. Just like my grandfather. Love the frame and the story behind it.